If you love the Asian theme of decorating the house then you will definitely love to decorate the nursery with paisley designs. 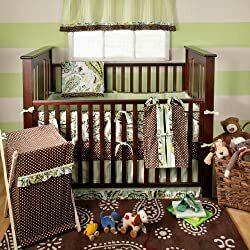 Paisley crib bedding with good looking paisley designs gives a unique look to the nursery. Most of them are not aware of what paisley designs are. They mean droplet shaped motifs which bear resemblance to mango shape. Here are a few paisley crib bedding ideas. • Paisley crib bedding is available in various color combinations. The best of them are the pink and brown, lime and brown, pink and purple etc. Pink and lime is a new combination which most of them prefer. 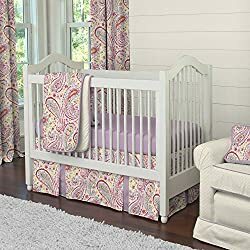 • For girl paisley crib bedding you can use pink colored paisley designs or a combination of pink and purple, pink and white. 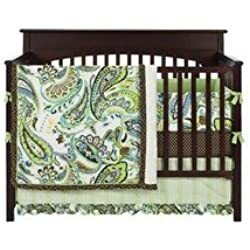 • For boy paisley crib bedding use blue colored paisley designs or blue and brown color combination. • To have unique looking trendy paisley crib bedding appliqué pieces of paisley designs over a plain fabric. Another idea for unique paisley crib bedding is to embroider simple elegant designs. • Generally use of entire bedding with a paisley design may look clumsy, so try either appliqué work or use bright colored plain borders. If you wish to give a clean look for your paisley crib bedding, use the paisley designs for throws and pillows and leave the bedding with a simple designs such as polka dots, simple stripes or solid color that matches with the paisley design color. • Paisley designs are best to use for new born babies rather than for toddlers who love to have fun filled designs. • For custom designed paisley crib bedding you can combine pictures of palm trees, single large flowers and paisley designs. Augment the beauty of paisley crib bedding by using wall paper borders and lampshades with paisley designs. To make it more interesting, dress a teddy bear using clothing with paisley designs and gives it as a sleeping partner for your baby.